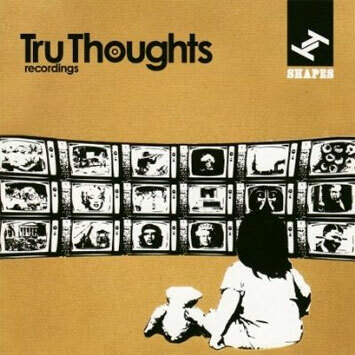 Compiled by Robert Luis, Shapes 08:01 is the latest instalment in the must-have series of Tru Thoughts compilations. This first collection of 2008 is headed in a deeper, more song-based direction, giving a tantalising taster of some of the best current music on the label, including a handful of exclusive releases. Tru Thoughts have snapped up an incredible array of exciting new talents of late, and this eclectic CD offers a chance to check out some of the latest additions to the roster, alongside a host of more familiar faces such as The Quantic Soul Orchestra, Hot 8 Brass Band, Nostalgia 77, The Bamboos and Alice Russell. The cream of the Zebra Traffic contingent is represented too, with contributions from Up Hygh (including an exclusive Owusu remix of "Be Known") and Dirty Diggers with "The Goodun Tune" remixed by Umod (aka Domu – BBC Radio 1Xtra). New signings Milez Benjiman, Kylie Auldist, Unforscene and Saravah Soul are currently on their debut outings for the label, which have variously grabbed the attention of the likes of Gilles Peterson, Domu, Mark Lamarr (BBC Radio 2) and been played on Radio1, BBC 6Music and XFM amongst others. Unforscene provide the opening track, "Belly Full Of Lead", a prime example of their masterful, cinematic productions; an atmospheric combination of modern and classical soundscapes and perfect beats. Having been players in the thriving Bristol music scene for a decade now, Unforscene have signed to Tru Thoughts to release their highly anticipated third album "Fingers and Thumbs". There is a refreshing diversity among the line-up of new acts showcased here, ranging from the punchy, Afro-Brazilian funk of Saravah Soul's catchy debut single "Nao Posso Te Levar A Serio" through Kylie Auldist's powerful and distinctive funk-laden soul on "Community Service Announcement", produced and backed by Lance Ferguson and The Bamboos. Add to that the slick beats, wobbly basslines and twisted future sounds of Milez Benjiman's "Crazy 'Bout Ya" and it is a sure sign of exciting times and sonic surprises ahead. Hot 8 Brass Band's star is most certainly in the ascendancy and "Fly Away", with its gospel-infused vocals and characteristically ramshackle jazzy sound, was one of the highlights of their "Rock With The Hot 8" album. This track was also recently featured on the Word Magazine cover-mount CD. After their sell-out UK tour in February and their appearance on The Culture Show on BBC2, Hot 8 Brass Band are in huge demand and will be back to play The Big Chill festival in August and a string of other dates around the UK. Long-standing Tru Thoughts crowd-pleasers The Quantic Soul Orchestra, fresh from their triumphant UK and European tour, appear here with the first ever CD release of "She Said What? (Version)". Speaking of Quantic, there's also a sneak preview of the latest in Will Holland's series of musical personae, with his Flowering Inferno dub version of Me&You's "Brown Paper Bag", the Roni Size cover that sent rooftops flying last year. Expect to be hearing more from Flowering Inferno this summer, as it's the name under which Quantic is releasing a series of gorgeous deep dub/reggae influenced singles and an album in the next few months. Kinny announces her return with "Back Street Lust" featuring Diesler, a heavy soul stormer taken from her forthcoming album. Nostalgia 77's mesmeric recent single "Quiet Dawn" appears as a treat to all those who missed it, complete with the remix by former Tru Thoughts artist Bonobo, and Belleruche's Northern Girls (Yam Who? Remix) is given its first outing on CD, having attracted high praise from Daddy G and DJ Andy Smith. Another exclusive treat on this CD is the killer Grant Phabao remix of Alice Russell's "Humankind" which is destined to become a firm favourite this summer, with spine-tingling vocals and the trademark Grant Phabao magic. To round up this stunning selection, Natural Self is back on Tru Thoughts, the home of his first releases, and he is on earth-shaking form as he proves with this self-penned, self-produced track, "Feet Keep Moving", on which he also provides the vocals. Definitely one to watch in the very near future, this is an upfront taster of his forthcoming album, "The Art Of Vibration".